Rated 3/5 based on 4 reviews. TPR KNUCKLE PROTECTION Isolated, hidden TPR knuckle design allows for independent knuckle splay and rotation, giving you amazing tactility while maintaining solid, reliable protection. FOAM KNUCKLE PADDING Closed cell, perforated foam offers bacteria resistant ventilation, while keeping your knuckles sufficiently guarded and nimble. 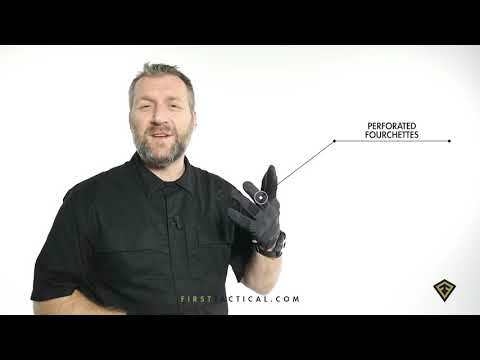 SUPERIOR MATERIAL Midweight, snagproof stretch woven material offers the most precise, professional fit and appearance you can expect from your tactical gloves. This is my second purchase in the First Tactical patrol gloves; the medium padded version being my first. Like the medium padded version this glove is well made and constructed. Unlike the medium padded version I unfortunately have to say the XL size is a very tight fit and not a very comfortable fit. It offers the same level of dexterity to access my Tactical options, and the touchscreen compatibility is equal effective. However due to its very tight fit, despite being the same size as the other glove, I am not able to properly field test this glove to the same level. In hindsight a 2XL would most likely be a better fit. The hard knuckles would certainly have their uses in the field and I generally enjoyed how it felt around my knuckles. Unfortunately as stated earlier due to the poor fit of these gloves I cannot say how well it holds up and performs on patrol. A few of us ordered these 2 months ago and haven't been rough with these gloves. The thumb stitching is already coming apart. My mates index finger glove is already fraying. I would strongly recommend another type of glove. The gloves feel fantastic on, however I ordered size XL, I can barely get them on my hands. Once on, the fingers are way too long. I have long fingers, large hands, don't think I am a short stumpy fella, im 6'4''. These gloves would be gun if they were fatter in the opening and shorter in the fingers. Good shooting gloves and great dexterity.